This post is late because I was sans computer for a little while, due to changing jobs and ordering a new iMac. But better late than never, right? My first run of the week was on Tuesday. It was, of course, a treadmill run. Shocker. And it was slow. Double shocker. There wasn’t much variety on the gym TVs, so I chose some news program to listen to. I did run/walk intervals while the show was on and then progressively faster runs through the commercials. Basically, when it went to commercial, I would start at 3.5. For each new commercial, I increased speed 0.5. That means by the last commercial before the show came back on, I was up to 6.0 or 6.5 and about to fly off the treadmill. (And curse the long commercials that come at the end of commercial breaks!) Once the show came back, I would walk it out for a minute or two and then do two minute running intervals. It seemed to pass the time nicely. I meant to go for half an hour, but I inadvertently hit the “Cool Down” button and once you hit that thing, there’s no going back. You have five minutes and then everything will reset. So I ended up doing 25 minutes instead. After that, I did 4.5 miles on the recumbent bike. I mentioned this last week, but I kind of love that thing. I mentioned hating stationary bikes before, but the recumbent bike is so nice for a running cool down. I can sit on that thing and pedal while browsing around on my phone or reading. I wish running could be so mindless. 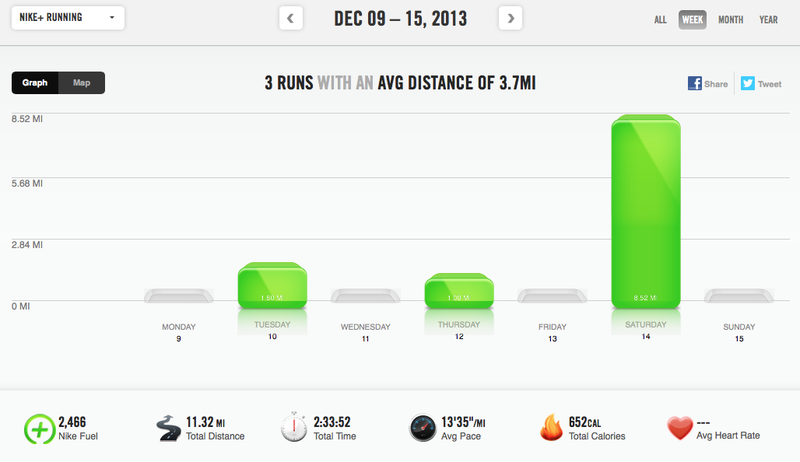 I was scheduled for another thirty minute run on Thursday, but everything went wrong when I got home. (For example, my cat threw up in my running shoe. In front of me.) I didn’t get to the gym till after 9pm and all I could muster up was a mile on the treadmill and a couple miles on the recumbent bike. I had been worried all week about Saturday’s eight mile long run. The forecast had been calling for 100% chance of rain, but I found a dry period of time and headed out. I planned to do some heart rate training, so I first set my Garmin to alert me whenever I went out of Zone 3 (which, for me, is defined as between 157 and 173 bpm). That seemed a little too easy, though, so after a mile, I switched it to Zone 4 (between 173 and 189 bpm). This was too tough, so I changed it again after another mile. After a couple more adjustment periods, I settled in on going between 165 and 185 bpm. My main plan was just walk when my heart rate got too high and start running again when it got too low. Once I found my sweet spot, that worked pretty well, and by mile seven I was feeling really good. So good, in fact, that I managed my fastest mile of the run and nearly ran the whole mile without walking. My heart rate only really got up over 185 up hills. However, I had a new development during mile eight: my knees started hurting. What?? I’ve never had my knees hurt when I run.